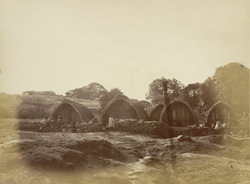 Photograph of Tarnat Mund, a Toda village in the Nilgiri Hills in Tamil Nadu, taken by an unknown photographer from the Madras School of Arts in c. 1871-72. This photograph forms Plate VIII of James Wilkinson Breeks 'An Account of the Primitive Tribes and Monuments of the Nilgiris' (India Museum, London, 1873). Breeks was the Commissioner of the Nilgiris and wished to make a record of the indigenous hill-tribes of the region before their way of life, customs and legends died out due to increasing western influences. The Todas live in communities in the Nilgiri Hills and their livelihood revolves around the local grasslands called 'sholas' and the herds of buffalo which they tend there. They have a rich tradition of crafts and are famous for their jewellery and elegantly draped cloaks and shawls that are decorated with traditional black and red embroidery. Breeks described this photograph as a Toda hamlet or village that consisted of about five buildings, three of which were inhabited, one that was used as a dairy and another as a stable for the buffalo calves. The houses seen in this view are built of bamboo that is closely laid together, fastened with rattan and covered with thatch, a process which renders them watertight.